Michael Komarck is an American artist and illustrator who specializes in digital paint. He has worked as an illustrator for the Star Wars Galaxies Trading Card Game by Sony Online Entertainment and has done illustrations for Magic: The Gathering and Hearthstone: Heroes of Warcraft, as well as Dungeons & Dragons. Michael has also illustrated comic books and book covers, most notably for authors Robert Aspirin and George RR Martin, among many others. Below you will find a sampling of his work. As usual, each image links to the artist’s gallery. Michael’s work is breathtaking. His ability to render even minute detail is phenomenal. These paintings mix photo-realism with fantastical elements and the result is an almost perfect marriage of style and fantasy. I am generally not a fan of photo-realism when it comes to fantasy, but I’m blown away by these paintings. I’m excited. This is how you paint a proper fantasy book cover. Let me know in the comments what you thought of these paintings. 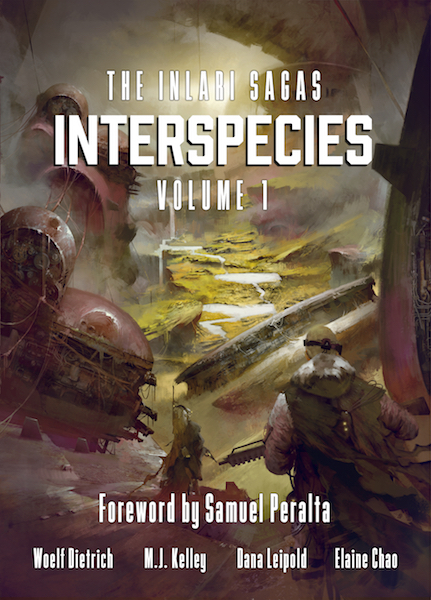 Also, remember my latest #Art of Science Fiction post is live right now on Kōsa Press. I really like the way he choses one dominant colour for every illustration. That creates a great, unique atmosphere for each one of them. I agree completely. I knew one or two of these that I have seen before, but I was more familiar with his older work. The images I have here are some of his newer work. Thanks for commenting, btw. I always love your insights.